Join us for a walk with bird expert and writer Laurence Rose at stunningly beautiful Leighton Moss RSPB Reserve. Listen, watch and learn about songs, behaviours, flight patterns and migration routes of the birds we find there. 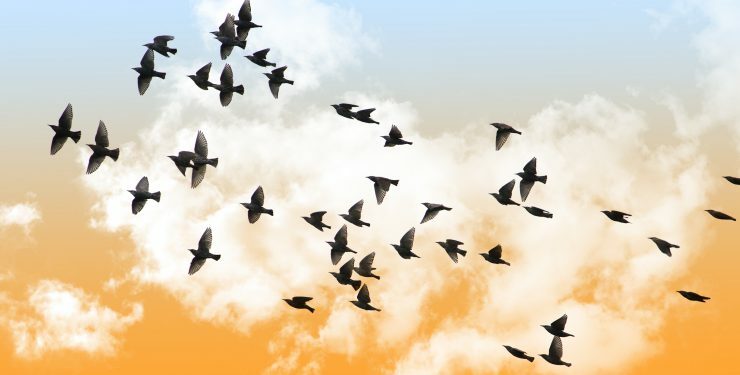 After a group lunch** poet Sarah Hymas and artist Kathy Hinde will lead a workshop inviting you to create short poems inspired by birds and to play with sound and light sculptures to ‘imitate’ bird song and send coded messages to each other. Following the workshop, we will return to the reed beds to try and find a murmuration of starlings; one of natures most breathtaking phenomena. * may finish slightly earlier or later depending on the time of starling murmurations. ** please bring packed lunch. Tea, coffee and soft drinks will be provided. 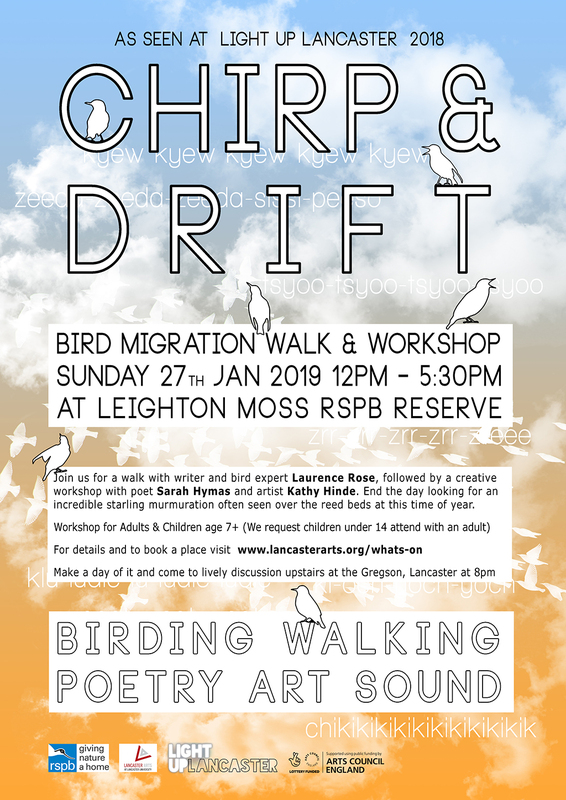 The walk and workshop is FREE but Leighton Moss RSPB reserve has a standard entrance fee of adults £8, Children £4 (first child free, under 5s free). Entry is free for RSPB members. Half price entry for arriving on public transport or by bike. Chirp & Drift is an ongoing project led by Kathy Hinde including walks, workshops, talks and a touring light and sound sculpture that premiered at Light Up Lancaster 2018. Make a full day of it and join Kathy, Sarah and Laurence for a lively talk and discussion upstairs at the Gregson, Lancaster at 8pm – details of the event here. Kathy Hinde’s work draws inspiration from behaviours and phenomena found in the natural world and is expressed through audio-visual installations and performances that combine sound, sculpture, image and light. Sarah Hymas writes, publishes and performs work about our ecology and personal and social histories: through poems, artist books and immersive walks. As a poet and facilitator, Sarah shares her practice so others can see, feel and understand the value and intrinsic role of creativity in our lives. Laurence Rose is a writer and conservationist who has worked for the RSPB for over 30 years. He recently authored ‘The Long Spring‘ published by Bloomsbury press. Thanks to Jonathan Carter at Leighton Moss RSPB bird reserve for hosting the event. Produced and supported by Lancaster Arts and Arts Council England.